Wholegrain oat flakes with freeze dried raspberry, cherry and strawberry fortified with vitamins & iron. 100% wholegrain oats. Low in salt. High fibre. Contains folic acid. Suitable for vegetarians. Deliciously Crispy! 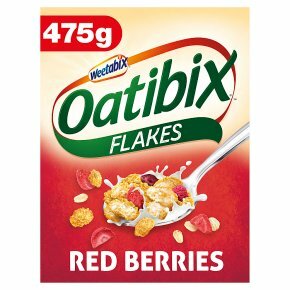 Our delicious new Oatibix flakes with red berries have all the goodness? of 100% wholegrain oats, combines with the sweet, zingy taste of raspberries, strawberries and cherries. Low in salt and high in fibre, it's an oatily great start to the day! ?Beta-glucans contributes to the maintenance of normal blood cholesterol levels as part of a healthy diet and lifestyle. One 30g serving provides 1.1g of beta glucan soluble fibre from whole oats, which is 40% of 3g, the suggested daily intake.